With the exception of her Little Castle glider, Meredith has just about everything she needs to put the finishing touches on Cohen's nursery. The glider should arrive sometime in the next two weeks, but until then, we'll try to knock out everything else. I'm exciting to see it all in person and help her get just the right look for baby Cohen's room. Since we're heading out of town, I decided to look up the Craigslist ads in Mer's area just for fun last night to see what they had to offer. Much to my surprise, I saw two wonderful finds. 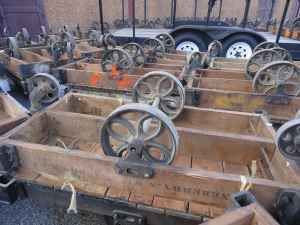 The first find are these factory carts. (Please excuse the picture quality on these...you know how Craigslist is). The asking price for these carts is only $165. You may think I'm crazy for including the word "only" but if you look at Restoration Hardware, you'll see that these babies are $895 on sale at their site. Therefore, $165=a steal! Plus, these are the real deal! 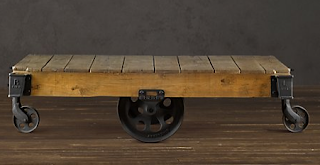 I think one of these would make an awesome coffee table! The other great find I came across were these metal stools. Guess what the asking price is on these. $5! Can you believe it?! Obviously it's hard to tell the exact state condition these are in due to the picture size, but for $5, can you really go wrong? These are so ridiculously cheap they have me giddy. Whether or not I come home with "new" furniture or not, I will be coming back with updated nursery pics for you guys. So stay tuned!